Divided into nine chapters, this volume begins with a discussion of vapor and liquid phase nonidealities and how they are calculated in terms of fugacity and activity coefficients, respectively. 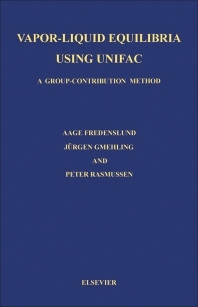 It then introduces the reader to the UNIFAC method and how it works, the procedure used in establishing the parameters needed for the model, prediction of binary and multicomponent vapor-liquid equilibria for a large number of systems, the potential of UNIFAC for predicting liquid-liquid equilibria, and how UNIFAC can be used to solve practical distillation design problems. This book will benefit process design engineers who want to reliably predict phase equilibria for designing distillation columns and other separation processes.